The KC-30A lands at RAAF Base Amberley. The RAAF’s first of five Airbus Military KC-30A Multi Role Tanker Transports (MRTT) arrived at Amberley on May 30 before being officially handed over to the RAAF on June 1, more than two and a half years later than the original November 2008 schedule. “This is a very major and long awaited milestone for the A330 MRTT program,” said Airbus Military CEO Domingo Ureña. “I wish to congratulate and thank herewith all the teams – internal and external, with special mention to our world class suppliers Cobham, Thales and Qantas. They all have been working extremely hard to develop, test and certify this all new multi role tanker and transport aircraft which really is the ’21st Century benchmark’ in its category. The aircraft, A39-003, was the third to be built and the second to be modified by Qantas Defence Services (QDS) at Brisbane. It began its delivery flight from Getafe near Madrid on May 27, and its ferry flight to Amberley was conducted by a mix of Airbus and RAAF crews via Las Vegas and Hawaii. 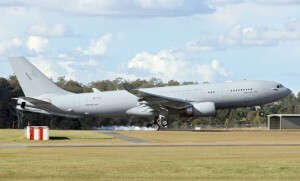 Following its arrival, the ADF will continue with the MRTT’s certification work and is expected to issue an Australian Military Airworthiness Certificate by August, after which 33SQN will embark on the KC-30A’s Australian Operational Test & Evaluation (OT&E) campaign in preparation for an initial operating capability (IOC) in 2012. A second MRTT is expected to be delivered in June, while the third and fourth will follow before the end of the year. A fifth ‘green’ aircraft arrived at QDS in Brisbane on May 25 and will begin its MRTT conversion cycle before being delivered to the RAAF early next year. Still to be resolved is the ongoing issue of where the KC-30As will have their Large Aircraft Infra-Red Counter Measures (LAIRCM) systems installed and tested following the withdrawal of US State Department approval for the work to be done by Airbus Military in Spain. A short Department of Defence video clip of the arrival can be viewed here. Great to see them arriving after being without this critical capability for years. We need to order a couple more now..
Great job getting them into service. Finally Air Combat Group will be able to fulfill there mission with tanker support. Have to agree with Wayne, Five just isn`t enough.